Reach Your Residents and Prospects - Now! occupancy rates through improved communication. faster using text messaging technology. greener, more effective and less expensive! and most (90%) are read within 3 minutes of receipt? You work hard to keep things running smoothly at your property. It can be challenging to stay on top of communications with residents and prospects and Text Mobile Alerts (TMA) can help. We provide communication tools to multifamily apartment managers and owners that make communicating easier, faster, greener, more effective and less expensive! Using our unique text messaging solution, you can easily send customized text messages individually or to groups by resident, unit, floor, building and/or your entire community with one click. 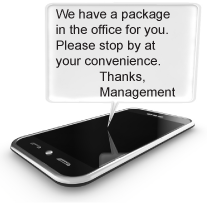 TMA's solution is based on SMS or text message technology because 98% of cell phones can receive a text message, 98% of people that receive a text message read it (and often times immediately) and because texting is the single most popular feature on cell phones today, even over voice/talking! With numbers like that you can be certain your residents and prospects will receive your communications. Although texting is clearly the fastest way to reach people, some people still prefer email, so TMA makes it easy for you to include an email copy of the text messages you send to residents, and you can even include attachments to emails if you want to. We know that you are busy, so TMA is web-based, meaning you can use TMA from any internet-enabled device and it requires no special hardware or software to download or learn. It's also super easy to use and takes about 5 minutes to master. You don't need a cell phone, you don't need to know how to text and you don't need any advanced computer skills to use TMA. In addition to saving your time and paper flier budget, TMA helps you retain residents longer and attract prospects faster, which goes directly to your bottom line. To retain residents longer, you can strengthen relationships and deepen loyalties by simply sending positive text messages to residents that minimize their inconveniences and maximize their quality of life at your community. To attract prospects faster, TMA enables you to build a database of prospective residents that you can proactively text to when you have vacancies to fill. Mobile marketing out performs online marketing across all brand metrics and response rates to mobile marketing are often 2 times to 10 times higher than to online marketing.